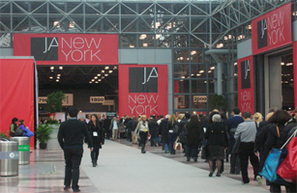 The semi annual JA Fine Jewelry Trade Show concluded its three day run this afternoon here in New York. It was one of the better events I’ve viewed in my 25th year of attendance.The show’s updated design and impressive turnout were positive developments, aided by the reasonable weather conditions at this tricky time of year.The convention center was bustling with three other significant fashion related trade shows running simultaneously. Those shows were the ENK-produced Coterie, which features apparel, Sole Commerce, a show dedicated to high-end footwear and handbags; and Accessories the Show. The Fine Jewelry Show featured trends that include sideways, or east-west, pendants in a multitude of shapes, edgier designs depicting snakes and spiders, and, on the other end of the spectrum, delicate necklaces spelling out a simple four-letter word: Love. My favorite innovation was a new designer ‘square’ allowing up and coming talent to be viewed in a concentrated area. I will put out an additional blog after my final show visit.